The Shabby Stamper: The June issue of the Paper Crafters Sampler is here! 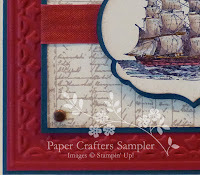 The June issue of the Paper Crafters Sampler is here! It's a red, white, blue theme for the month of June. Stars, stripes and fun 'Sweet Liberty' themed table decor. Great projects for July 4th, Memorial Day, Veterans Day or flag day. The template of the month is the "Simply Starry" favor box. Go here to purchase your online copy today!